Philadelphia area teams, both amateur and professional, have a long history of appearances in the final of America’s oldest national soccer competition, winning the US Open Cup ten times. The last Philadelphia team to do so was the Ukrainian Nationals in 1966. At PPL Park on Sept. 30 at 7 pm, the Philadelphia Union will look to restart that winning tradition. Before the founding of the US Open Cup in the 1913–1914 season, the claim for a national soccer title was held by the American Cup competition, also known as the American Football Association Cup and the American Federation Cup. First organized by the American Football Association in 1885, the competition primarily featured teams from the early American soccer triangle of northern New Jersey, southern New York and lower New England. In 1897, the John A. Manz team became the first Philadelphia club to win the American Cup. Tacony won in 1910 with Philadelphia Hibernian losing in the final the following year. In 1914, Bethlehem Steel FC won the first of its six American Cup titles by beating Tacony, who had also lost to Northern New Jersey’s Paterson True Blues in the final the year before. The US Open Cup would eventually supplant the American Cup competition. 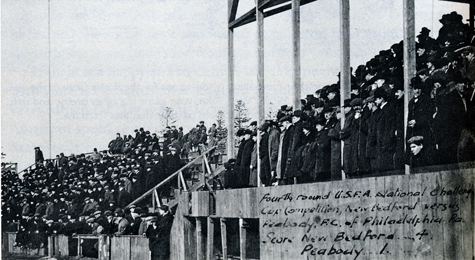 Limited by both geographic shortsightedness, as evidenced by its reluctance to expand the American Cup competition outside of its home region (no team further West than Eastern Pennsylvania ever won the final), institutional resistance to professional clubs and leagues, and by an Anglo-centric worldview of the game, the AFA would be rendered irrelevant by the United States Football Association, now known as the US Soccer Federation. Founded in 1913 (and Philadelphia-area league administrators and clubs were instrumental in the USFA’s founding), the USFA’s desire to be a truly national governing body would lead to it being officially recognized by FIFA in 1914. The AFA limped along for another ten years with the last American Cup final being played in 1924. Bethlehem Steel was the winner. The first winner of the US Open Cup, originally known as the National Challenge Cup, was the Brooklyn Field Club. Seven Philadelphia-area clubs participated in the early rounds of the first competition—Bethlehem, Disston FC, Tacony, West Philadelphia, Kensington, Wissinoming, and Peabody FC. Only Peabody advanced beyond the third round, being knocked out by New Bedford in the fourth round. Bethlehem was defeated in the third round by eventual winner Brooklyn Field Club 1–0 on January 25, 1914. 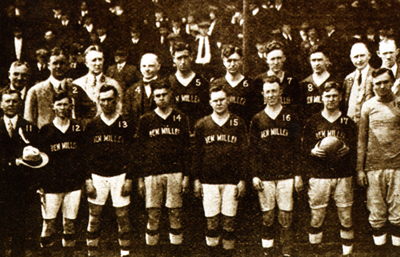 It took only one year for Bethlehem to claim its first US Open Cup title, an honor they held four out of next five years (1915, 1916, 1918, 1919), losing to Fall River Rovers in 1917, and the Ben Millers club of St. Louis in 1920, thus twice missing out on becoming the first team to win the competition three years in a row. While the Bethlehem side was heavily stocked with foreign-born players, Ben Millers featured local, native-born players. Bethlehem would have to wait six years to secure their revenge, defeating Ben Millers 7–2 for the Cup at Ebbets Field in Brooklyn on April 11, 1926. Ten years would pass before Philadelphia would again win the US Open Cup in 1936 when the Philadelphia German Americans defeated St. Louis Shamrocks by an aggregate score of 5–2. In doing so, the German Americans became the first amateur team to win the competition. The Shamrocks were the continuation of the St. Louis Stix, Baer and Fuller team that had won the Cup in 1933 and 1934, and again in 1935 playing as St. Louis Central Breweries, to become the first team to win the Cup three times in a row. Along with player/coach and eventual US Soccer Hall of Famer Alex McNab, the team also featured World Cup veterans Billy Gonsalves, Werner Nilsen, and Bert Patenaude. The Philadelphia German Americans were no slouches themselves, having won the American Soccer League title the year before, and boasted 1934 World Cup US national team veterans such as Bill Fiedler, Al Harker, Peter Pietras, and Francis Ryan, all of whom, unlike their St. Louis counterparts, were born in or around the city they represented. The German Americans played the Shamrocks to a 2–2 draw in the first leg in St. Louis on April 28, 1936 before beating them 3–1 at the Rifle Club grounds in Philadelphia in front of some 8,000 spectators on May 3, 1936. 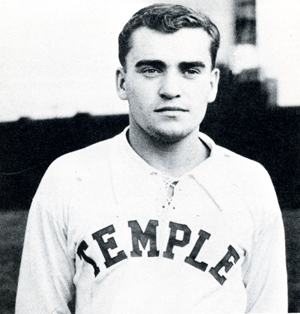 Two of the German American’s goals in Philadelphia were scored by George Nemchik, at the time a student at Temple University. Nemchik would be a US Cup champion again in 1945 with New York’s Brookhattan club. In 1939, the team reached the finals for the last time, losing 2-3 on aggregate to St. Mary’s Celtic of Brooklyn. While the German Americans would eventually be known as the Philadelphia Americans and go on to win the ASL championship six more times, reaching the Open Cup semifinals in 1948 only to lose 5-2 to Brookhattan, before becoming Uhrik Truckers in 1953 and winning the league championship two more times, a Philadelphia team would not appear in a US Open Cup final for another 13 years. The Philadelphia Nationals were founded as Passon Phillies in 1936, the same year the German Americans won the US Open Cup, making it to the Cup quarterfinals in the the 1950 US team that defeated England in the World Cup. The Nats would win the American Soccer League title four times before folding in 1954. In 1949 the Nats faced Morgan Strasser in an all-Pennsylvania US Open Cup final. The Western PA team had lost the 1943 and 1944 US Open Cup finals to Brooklyn Hispano. The Nationals defeated Morgan 1–0 in the first leg in Philadelphia at Holmes Stadium before falling 4–2 in the second leg in Pittsburgh to lose the Cup. The Nationals again made it to another all-Pennsylvania final in 1952 when they faced the Pittsburgh-area Harmarville Hurricanes. In the first leg, the Nats won 4–3 in Pittsburgh only to fall 4-1 in Philadelphia at Holmes Stadium. Harmaville would lose in the 1953 final before winning the Cup again in 1956. Philadelphia would finally regain the US Open Cup in 1960 when the Ukrainian Nationals defeated the Los Angeles Kickers. The Cup final was played as a single leg that year, but the Ukrainian Nationals needed two games to top Fall River SC in the semifinals after first battling to a 1–1 draw before defeating the Massachusetts team 2–0 in the deciding game. At Edison Field in Philadelphia on May 29, 1960, the Uke Nats made no mistake, defeating the Kickers 5–3 in another final that had to go to extra time. Walt Chyzowych played at Temple before joining Ukrainian Nationals, with whome he won the 1963 US Open Cup. He would go on to a long coaching career that included the top spot at Philadelphia Textile as well as the US National Team from 1976-1980. The win marked the beginning of something of a dynasty as the Philadelphia team would go on to win the ASL championship in 1961, 1962, 1963, 1964, and again in 1970. They would complete the double when they won the US Open Cup again in 1961, defeating the United Scots of Southern California by an aggregate of 7–4, but were prevented from winning three times in a row by eventual 1962 Cup winners Hungaria SC of New York in the semifinals. Undaunted, the Ukrainian Nationals reclaimed the Cup in 1963, outscoring their opponents 11–0 in the quarter and semifinals before defeating Southern California’s Armenian SC 1–0 after extra time in the single leg final on June 2 in Philadelphia. They gave up the Cup in 1964 to Los Angeles Kickers-Victoria in the finals by an aggregate of 4–2. The first leg had been played to a 2–2 draw after extra time at Cambria Field in Philadelphia on June 1 with Walt Chyzowych scoring both goals for Philadelphia. On June 21, Philadelphia lost the second leg to the Kickers 2–0 in Los Angeles. In 1965, the Uke Nats were defeated by Ukrainian SC of Eastern New York in the semifinals by an aggregate score of 4–3. The Ukrainian Nationals won the Cup for the fourth and final time in 1966, outscoring all opposition by the incredible total of 16–1 from the quarterfinals through the two-leg final against Orange County SC. The Ukrainians made it as far as the quarterfinals in 1967 and the semifinals in 1968, when they were eliminated by Greek American SC 3–2 on aggregate after a semifinal draw necessitated a replay. Greek American would win their second Cup in a row that year before becoming only the second team in the competition’s history to make it three in a row in 1969. In the years following its first season in 1968, the North American Soccer League helped to put soccer back onto the wider American sports landscape. International stars came to play in the league and the New York Cosmos would soon emerge as a global brand. Television coverage encouraged interest and participation in the sport, which itself would lead to the return of a US team to the World Cup for the first time in 40 years in 1990 and to the wildly successful hosting of the 1994 World Cup. But by 1994, the NASL had been dead for ten years, imploding under the weight of ill-managed growth and unsustainable payrolls. And while the history of the NASL would include first the Philadelphia Atoms (1973-1975) and the Philadelphia Fury (1978-1980), that history would not include participation in the US Open Cup. Perhaps the most amazing thing about the cup was that it somehow managed to keep going, producing champions year after year even when hardly anyone was paying attention. This isn’t to demean the success of clubs like Philadelphia’s Ukrainian Nationals, who reached the final five years out of seven in the 1960s, or Maddabi [sic] of Los Angeles, four-time champions a decade later. But their achievements were witnessed by few and went all but unreported by the media. It is easy for the glow the golden years of the NASL, perhaps a three-year period in the 16 years of the league, to blind us to the fact that much of the league’s history was in fact one of a struggle for survival and, from its beginning, NASL teams declined to participate in the US Open Cup tournament. The early rounds of competition took place during the NASL’s offseason and participation in the tournament was viewed as offering little benefit to the league. Philadelphia returned to the US Open Cup final in 1977, when United German Hungarians faced Maccabee of Los Angeles on June 19. Sadly, UGH lost, 5–1. UGH would also appear in the National Amateur Cup on July 24 of that year, where they were defeated by Denver Kickers, 3–1. UGH made the last Cup final appearance by a Philadelphia-area club before the Union’s 2014 final appearance in 1993 when they faced San Francisco’s CD Mexico on July 17 at Kuntz Stadium in Indianapolis only to be defeated 5–0. In 1994, UGH hosted the Open Cup final. Philadelphia Flames made it as far as the semifinals before being defeated 3–0 by that year’s eventual Cup winner, Greek American AC. Whatever one may feel about the inconsistent level of support among MLS teams for the Open Cup, its participation since the league’s debut in 1996 has been key to the growing prestige the tournament enjoys among the wider American soccer public. Philadelphia-area amateur and professional teams such as Hershey Wildcats, New Jersey Stallions, Reading Rage, South Jersey Barons, Vereinigung Erzgebirge, Ocean City Barons, Harrisburg City Islanders, Reading United and Phoenix SC have all made it at least as far as the first round since the beginning of the MLS-era in 1996. In the first two years after the Union began its first season in MLS in 2010, MLS teams that had not automatically qualified for the Cup on the basis of the previous year’s league standings faced each other in play-in matches to qualify for the first round of the tournament. In 2010, the Union lost its first play-in match to New York Red Bulls. In 2011, the Union failed to get past DC United in a Cup play-in match that was decided by penalty kicks. A change in the tournament format in 2012 meant that the Union automatically entered in the third round, where they defeated USL PRO club Rochester Rhinos on May 29. In the fourth round, they found their revenge against DC United, defeating them 2–1 after extra time on June 5. In the quarterfinals on June 26 they defeated Harrisburg City Islanders 5-2 to advance to host the semifinal match against Sporting Kansas City on July 11, losing 2-0. Kansas City would go on to defeat Seattle Sounders in the 2012 Open Cup final. After defeating PDL side Ocean City Nor’easters 2-1 on May 28 in the third round of the 2013 tournament, the Union fell 3-1 to eventual Open Cup Champions DC United in the fourth round on June 12. The Union’s 2014 Open Cup run began with two games that went to extra time. On June 17, the Union defeated Harrisburg City Islanders, 3-1. One week later on June 24, the Union defeated New York Cosmos, 2-1. A 2-0 win over New England Revolution on July 8 set up the semifinal meeting with FC Dallas, won 4-3 on penalty kicks by the Union after 120 minutes of play finished with both teams level at 1-1. Philadelphia would lose the 2014 final, 3-1, at PPL Park to Seattle Sounders. The Union’s run to the 2015 final included two games that were won on penalty kicks after extra time. Over the course of the four games leading up to the final, Philadelphia conceded only two goals. Previous versions of this article were first published on October 4, 2011, July 10, 2012, and August 13, 2014. Ed. You know so many interesting things. I love love love these articles! Always a pleasure to read the historic articles here, Ed. Thanks!! Cracking stuff as always, Ed. Someday we’ll see all this in a book with your name on it. Excellent coverage yet again Ed. Thank you for this. It really does help show the deep rich history that the tournament has. Also love the props you show Harrisburg. Good luck to the Union next Tuesday night. I think its cool that VE, the Ukies and Phoenix have all played in this cup – those are the teams my kids now play against! What about “Philadelphia Inter” in the late ’60’s, early ’70’s? Thought that they had won the Cup or, at least, had progressed quite far. Didn’t Bayern FC (’70’s) do well, too? Philadelphia Inter were a great Philly soccer team but they never won the US Open Cup. In 1974, they were defeated in the quarterfinals 2-1 by Casa Bianca. In 1975 they were defeated on penalty kicks in the quarterfinals after drawing 1-1 with Croatian Rebels. In 1988 they were defeated in the Region 1 semifinals 3-2 by Spartans FC. In 1989, their last US Open Cup appearance, they were again defeated in the Region 1 semifinals 3-2, this time by Uprising SC. Philadelphia Inter did win the National Amateur Cup in 1973 and 1974, defeating San Jose Grenadiers in ’73 and then St. Louis Big Four Chevrolet SC in ’74. They made it to the National Amateur Cup final again in 1988 and 1989, losing first to Dallas Mean Green in ’88 and then A.A.C. Eagles in ’89. You can read an article from the July 9, 1989 edition of the Inquirer about their National Amateur Cup campaign of that year here. OK, great, Ed. Wasn’t sure if it were the Open Cup or the Amateur Cup re Philly Inter and Bayern FC. Thnx for the clarification. Maybe a review of the Philly Amateur Cup champs? Still got the thropy from 1974…..40 years ago……we were a good team…Walt Cyesowch…good Coach. Always interested to read about soccer history in this country, something I know virtually nothing about pre-MLS era. Considering the well known story of Jackie Robinson in MLB, and for fans of the NHL Willie O’Ree, I’m wondering about integration in American soccer. Given the extremely spotty nature of professional soccer leagues for most of the 20th century I would guess the topic might be harder to track. Ed, any facts on this you’ve come across in your research? Was there an explicit prohibition of minority players in the early decades of US Open Cup? If so, was there any officially recognized watershed moment when that color line was broken? Any players like Robinson or O’Ree who are credited with being the first? I noticed the Union wore their Bethlehem Steel jerseys last night, I’m guessing the Union would (and should) wear their Bethlehem Steel Jerseys for the final. Greatly enjoy these history lessons, Ed. 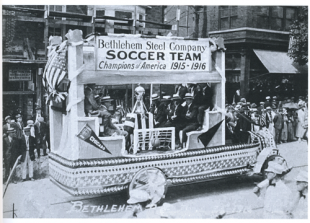 A few years back, I did a school project on Bethlehem Steel, the Open Cup, and soccer in the United States during the 1910s, 20s, and 30s. Brings back good memories of the mining I had to do to uncover information. Such a rich history of the sport, and hopefully the Union will be adding to the rich history of Philadelphia area teams in this competition. Ed, great article! This was a pleasure to read and I enjoyed learning some history on local PA soccer. Thanks for sharing your knowledge. Great stuff. Interesting how we often we hear how ‘young’ the game is in this country when in fact it is quite storied. What separates us from other countries with similarly storied histories is the learning curve. Hi….i played whith the Philadelphia Inter in 1974…i still got the trophy they gave us…we were Champion that year…Good memories…..Mamma Mia….Ballarini …Di Donna..Di Sandro..Mandracchia..Seals..Pilla…the Coach.. Walt Chesowich…..i had a lot of Pictures ..but i lost it thru the years. If you want yo replay…( leonardmazzei@verizon.net ) thankyou. Ciao. Great stuff as usual Mr. Farnsworth. The USOC has such a remarkable history and the Pa/Phila perspective is unlike any other accounts I have previously read. Thank you for writing this.